So according to others, I was apparently supposed to be part of the “12 Days of Christmas” craze that’s sweeping the blogosphere, and I’m kinda confused on how that impression came to be. I’m planning on doing what I did last year with the “Impressions on a Year 2008” coming soon after Christmas, but nothing of the sort was happening before the holiday. At the same time, I feel guilty when I see links from other blogs saying that I’m participating in it when I’m not, so I figured that I should go and do something about it. And from the outset be lazy and selfish about it. So, instead of covering my thoughts on the year of anime that I saw, I decided to write about what I thought were the best posts on DMAB this year, even though December isn’t over yet. Of course there’s bias involved here (yay self-horn tooting! ), so if you have different favorites than I do, please feel free to say so. Nor is this post itself going to be the pinnacle of good writing (as I’m tired and lazy right now), but I feel that this helps people who haven’t bothered to check out the blog before, and at least it gives me some time to reflect on things. A mix-up almost as bad as this one? I usually don’t respond to posts this way (since I usually have a concord rather than a discord with posts that I mention on the blog), but I knew that Owen was going to write a post about why he thinks that Lucky Star is a show that is more “Slice-of-Life” in comparison to, say, Hidamari Sketch for a while now. So now that it’s here, I might as well respond to it like I’ve been planning on doing all along. Maybe it was because I expected to be blown away by Owen’s stunning logic, or that I’m much more solidly in the Hidamari camp (you can see that it’s among my all-time faves on my MAL, despite it being cheap) than the Lucky Star camp, and/or maybe it was because I was running on four hours of sleep the night before. But my general response to the post was summed up by “Meh” and “I think Sat-chan might be a little off with his reasoning there”. So for a nice point-counterpoint exchange, I’m going to try to explain why I feel this way as best and as respectful as I can, though there’s a niggling thought in the back of my head saying that I didn’t read his post right to do this. But what the hey. That’s how politics can be won. 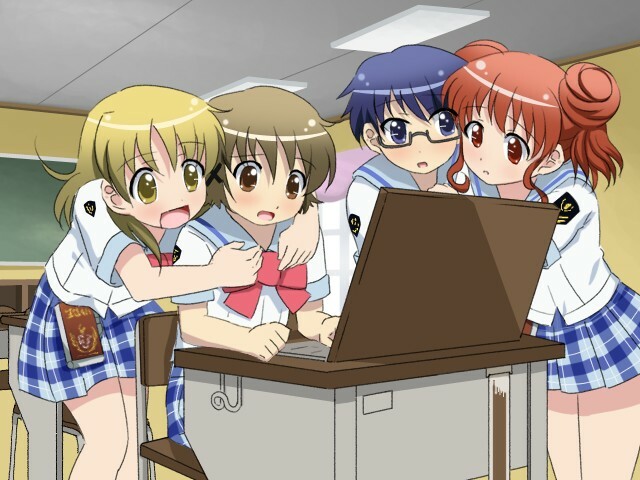 A “Character Study” on Hidamari Sketch with Pictures and Sentences. Duh. I’m not the only one that’s pleased that someone has finally subbed the Hidamari Sketch specials (now if only Sketchbook could finish at least :P). As you’ve seen on this blog, the series is one of my favorites, and I keep trying to get people to take a look at it, and it’s working slowly but surely. :3 And I figure that it’s been a while (not really) since I’ve written a post on Hidamari that I should set up shop again. Besides making me wonder what would have happened had Shinbo and co. taken a more… proactive approach on the show (I think it would be awesome fun, but then I usually think that about most SHAFT productions), the specials reminded me how much I liked the characters and the things they do. Since I’m a very easy person to please, I was pleased so much by these two episodes that I felt like showing most of the cast off here. To help with this, I’ve included a shot or two that I thought personifies most, if not all of, the qualities that I see in each of the characters. 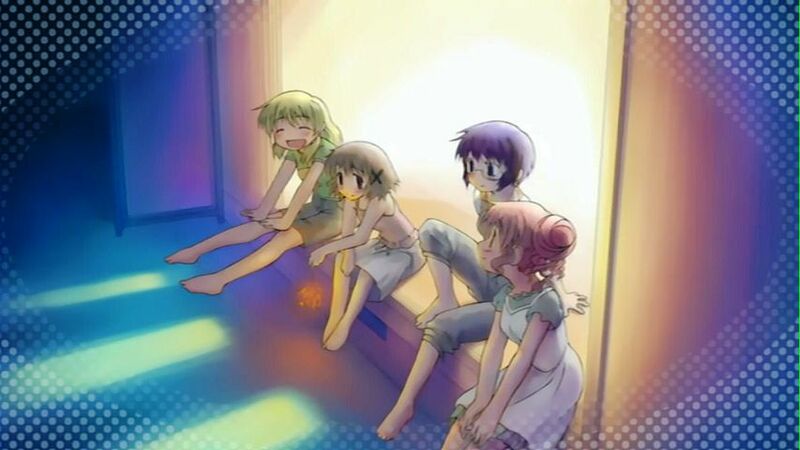 All of these pictures are from the first Hidamari special, which is made of much win and awesome, though the second special is the same way, only in different areas. This is all in fun (i.e, not meant to be a great post), and as always, feel free to add on, take off, or conflagrate my thoughts as you see them here.